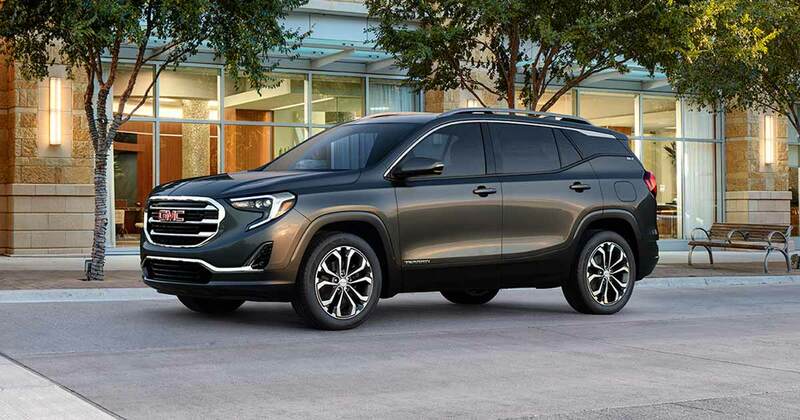 It’s that time of year at Budds—when we roll out new models like the 2018 GMC Terrain. That’s got us excited… You? People complained when Dylan went electric. Grumbles were heard when composites started replacing traditional wooden hockey sticks. Heck, some people just don’t like change. There’s probably even a few who prefer the old GMC Terrain to the all-new 2018 model. The last generation Terrain was a great SUV and it had a lot of fans. And we all know it takes courage to replace a winning design but GMC doesn’t believe in standing still—and that’s why we have a completely new Terrain. It’s very slightly smaller than before and comes with a choice of three new engines, yet retains all the virtues that made the previous generation such a success. Read on for a closer look. The 2018 GMC Terrain is about 10cm shorter than the outgoing model, and just a couple wider. That makes it easier to squeeze into tight parking spots but also trims some weight. In fact, the new model has lost around 150kg, making it even more agile and fuel-efficient. Clever design means that shrinkage has minimal impact on interior volume. While space behind the second-row seats drops a few litres, it’s more than compensated by the new flat-folding seat mechanism. These make it possible to load up with the kind of cargo that typically needs a pickup to transport. The outgoing Terrain had an upright stance and a somewhat squared-off appearance. It looked good, but the 2018 model advances that design language. The new ’18 seems to offer more flowing lines (while still looking distinctly GMC). Slide into the driver’s seat and you’ll notice something’s missing: there’s no shift lever! 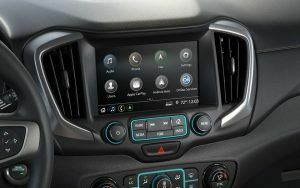 GMC has swapped it out for buttons at the base of the console. That change, startling at first, frees up space in the center console. Where the shifter was you can now place your phone or a coffee. Now, once you’re over that change, take a look around. Every trim level, (there are three,) gets a soft, leather-wrapped steering wheel, signaling the quality of materials used throughout. The aluminum trim pieces really are aluminum and everything looks and feels well put together. In the center of the dashboard, you’ll see a 7” screen for the infotainment system, (8” in the SLT and Denali trim levels.) This handles all your music and phone needs and features Apple CarPlay and Android Auto connectivity. That lets the screen mirror your phone so everything you need is easy to reach. For 2018, Terrain buyers can choose between three engines. The SLE trim comes with a 1.5 litre turbo but can be upgraded to the 2.0 liter found in the SLT and Denali. There’s also a 1.6 litre diesel, for those who really want both torque and frugality. Both gasoline engines send their power through a new nine-speed transmission that delivers shifts so smooth you’ll likely not even notice them. SLE trim comes with front-wheel-drive but can be upgraded to AWD. SLT and Denali models just come with AWD. The new Terrain isn’t just lighter, it’s also stiffer. That translates to improved feel and responsiveness on the road. There’s little roll through the curves yet it’s composed and stable at highway speeds. Whether you’re planning a cross-country road trip or a quick jaunt to the mall, riding in the Terrain will never leave you tired or aching. If you liked the old Terrain, you’ll love the new one. It’s packed full of updates and upgrades that improve upon the original. And if you’re not familiar with the Terrain, but like the idea of driving a totally new, state-of-the-art SUV, come down to Budds’ Chevrolet Cadillac Buick GMC. We’ll explain the different trims, introduce you to all the available safety technology, and show you why newer is better—and change is good.